Loveshaw has been specializing in industrial grade case sealers for over 50 years. 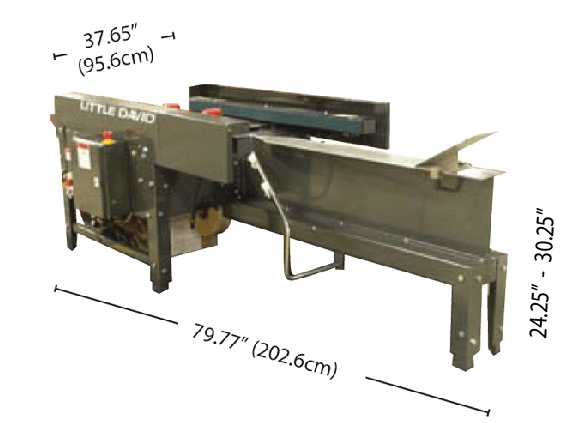 It is with a high-quality ad integrity focused drive that introduces the latest case sealer: The Little David SP-304R BO. This sealer provides a consistent seal by utilizing a random side belt that moves the case through a folding area and right over the tape cartridge. In combination with a table station, an operator has space to form the case prior to sealing. The tool-less quick release wipe rollers and knife blade accompanying the CaseLocker 60 tape cartridge are patent-pending. Eliminate ergonomic risk factors by reducing operator fatigue and repetitive motion syndrome. The SP-304R BO Semi-Automatic Random Case Former, combined with the CaseLocker 60 tape cartridge, is an ideal machine for erecting and bottom-sealing random cases for those utilizing a variety of case sizes. Standard Voltage: 120/1/60 with 15 amp dedicated service. * Optional voltages are available, please consult factory.